As of April 1, 2010, the date of the 2010 United States Census, the 9 most populous U.S. states contain slightly more than half of the total population. The 25 least populous states contain less than one-sixth of the total population. California, the most populous state, contains more people than the 21 least populous states combined, and Wyoming, the least populous state, has a population less than that of the 31 most populous U.S. cities. 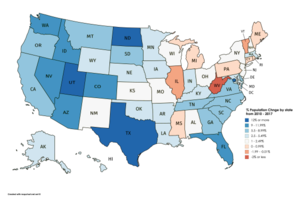 ^ This figure for each state compares to a national increase of 5.50%. ^ Each state has a number of votes in the Electoral College equal to two more than its number of representatives in the U.S. House, while DC is granted 3 electoral votes. The Electoral College is used to elect the President and Vice President of the United States. ^ Because of rounding of the individual percentages, the entries in this column may not sum to 100%. Puerto Rico 1 3,195,153 1 3,725,789 1 3,808,610 3 -2.2% Terr. Guam 2 [note 1] 2 159,358 2 154,805 1 2.9% Terr. U.S. Virgin Islands 3 [note 1] 3 106,405 3 108,612 2 -2.0% Terr. American Samoa 4 [note 1] 4 55,519 5 57,291 4 -3.1% Terr. Northern Mariana Islands 5 [note 1] 5 53,883 4 69,221 5 -22.2% Terr. ^ a b c d e There is no official population estimate for American Samoa, Guam, Northern Mariana Islands, and United States Virgin Islands between the decennial censuses. "National Totals: Vintage 2015". United States Census Bureau. Archived from the original on 23 December 2015. Retrieved 24 December 2015. "2010 Resident Population Data". U. S. Census Bureau. Retrieved 2010-12-26. "2009 Census estimates". U. S. Census Bureau. Archived from the original on 2010-08-07. Retrieved 2010-08-13. ^ Office of the Federal Register. "A Procedural Guide to the Electoral College". National Archives and Records Administration. Archived from the original on 2010-05-28. Retrieved 2010-08-13. ^ "Annual Estimates of the Resident Population for the United States, Regions, States, and Puerto Rico: April 1, 2010 to July 1, 2018" (XLSX). United States Census Bureau. Retrieved December 21, 2017. ^ "U.S. Virgin Islands Population (2018) - Worldometers". www.worldometers.info. ^ "American Samoa Population (2018) - Worldometers". www.worldometers.info.